The current Canadian Opera Company production of La Cenerentola brings me face to face with one of the great themes, and sorry if I am about to sound like your junior high English teacher. While the opera probably can be explored in several ways, this production concentrates on the great question of how we reconcile illusion and reality. This co-production of Houston Grand Opera Association, Welsh National Opera, Gran Teatre del Liceu and Grand Théâtre de Genève, employing Els Comediants from Spain in the production team (Joan Font as director, Joan Guillén as set & costume designer) now has come to Toronto. I will quickly say it’s a huge success musically, and then set that aside while I talk about the production, one of the most remarkable I have ever seen. Els Comediants bring a unique flavour to this production. They’re known for a carnivalesque approach that they employed in the time of Franco as a kind of protest. It shouldn’t therefore be surprising that they manage to preserve the fun of this fairytale, while infusing it with an activist sensibility, taking Cinderella to unexpected depths. At first glance the eye is almost overwhelmed by the colourful excess of the design. While Angelina (Cinderella) is in the appropriate muted browns, while cleaning the floor, her two step-sisters’ outfits are clownishly flamboyant. a 2010 production of Wagner’s Lohengrin directed by Hans Neuenfels. If originality counts for anything, it needs to be said that the Comediants’ rodents predate Neuenfels by at least three year (and thank you Opera Chic for the images from Bayreuth). Unpacking the metaphor could push me to thousands of words. But imagine that this light tale suddenly acquires unexpected weight. Cinderella shares her oppression with silent witnesses. 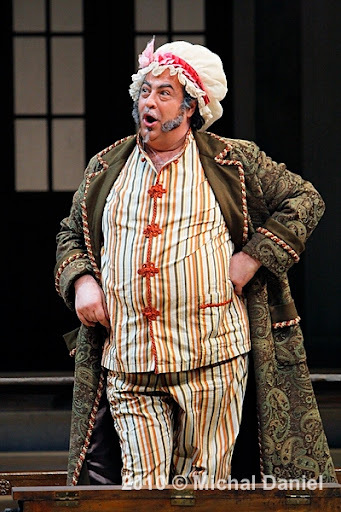 As I set aside my concern and confusion during the first part of the opera I was untroubled, because I was busy laughing at Donato DiStefano’s astonishing portrayal of Don Magnifico, alternatively funny, disgusting, terrifying, and always framed within a traditional buffo approach to the singing and acting. Partway through the first act I overcame my confusion, when everything clicked into focus as something very deliberate and self-consistent. Don Magnifico & his daughters (Cinderella’s step-sisters) have a very different value system than Cinderella, mistaking the trappings and the wealth for real value, claiming to be better than a mere servant. In a world of playful and flamboyant dress-up, transformation and magic are possible. Ramiro (the Prince) and his servant exchange roles, fooling Don Magnifico’s family, but not Cinderella, who knows who she is and what she wants. The rodents are more real than any other part of the opera, taking on the role of puppeteers in the enacted shadow-puppetry illustration of Ramiro’s carriage accident: the providential turning point of the plot whereby Cinderella and the Prince are brought together. It’s spooky how powerful some of this can be, when you’re laughing so hard, yet seeing something so dream-like. At no time were we led away from the text, as the production respects Rossini, even as it shows us unexpected depths. Although all the principals had wonderful moments DiStefano was the most interesting portrayal to watch, whether sleepy, pompous, threatening, drunk, afraid or sneering with disbelief at his step-daughter’s surprising elevation. I could go on about DiStefano’s vocal delivery, a catalogue of the possible comical sounds a buffo singer can make. Yes he’s funny. He’s also completely in character while singing, so persuasive that you get lost in the opera. While prettier of voice than DiStefano, Brett Polegato’s Dandini gave DiStefano a run for the money. Polegato had a voice that’s apt for bel canto while being one of the comic stars of the performance. Elizabeth DeShong as Cinderella was thoroughly musical, not just coloratura & high notes, but a beautiful tone in her lower register as well. Kyle Ketelsen brought a majestic sound to the role of Alidoro, the philosopher who—at least in this production—helps Cinderella through a magical transformation. I said the singing was good? But that doesn’t really do it justice. Lawrence Brownlee as Ramiro (the Prince) has an amazingvoice, one of the best voices I have ever heard in person. I experienced Leontyne Price, Luciano Pavarotti, Birgit Nilsson, and Jon Vickers, each a visceral experience for different reasons. I feel I have to put Brownlee in a similar category. Given the ability to edit recordings, or to choose from the best take, it’s important to recognize the drama of a live performance. Brownlee nailed a whole series of high Cs (one for at least 5 seconds), never going off pitch, never sounding uncomfortable, always musical, and a complete thrill. No, it’s not the biggest voice I’ve ever heard (nor was Pavarotti come to think of it); but it’s perfect for this material. See for yourself (either in this clip OR in person). La Cenerentola will continue to bewitch us at the Four Seasons Theatre until May 25th. This entry was posted in Opera, Reviews. Bookmark the permalink. Excellent! Could not have said it better. Nice clip, too. It reinforces my impression of the joyfulness of Lawrence Brownlee’s singing. Rossini was such a master at using comedy to teach important truths, and as you say, this production really brings that home. You make a nice point about Rossini. I think he’s been under-estimated for more than a century. And thanks for the kind words.